Maybe it was the lockout. Maybe it is the rule changes. Maybe it is an over-abundance of youth and inexperience at key positions around the league. Maybe it is just the dawn of a new era and this is what we are to expect going forward. But, for whatever reason (or combination of reasons) the 2011 NFL season was easily the strangest NFL season I can remember. Think all seasons present “oddities?” Think I’m just finding a reason why the most talented Eagles team of my lifetime didn’t win the worst NFC East of my lifetime? Think I’m just heaping on my usual overdose of hyperbole? You might be right, but let me offer a few quick reasons why this season was simply nuts. Anyone who has followed the NFL even a little bit knows that the Lions and Bengals are the annual league doormats. The last playoff win for the Bengals came over some team named the Houston Oilers 22 years ago. That means that the Lions fans can’t complain about their team’s 21 years since their last postseason win (which was followed up by getting drubbed 41-10 in the 1991 NFC Championship Game). Then again, at least the Bengals have been there in the past couple of years. The Lions haven’t even made the playoffs since the 20th Century. Oh, and then there is the Texans, who, before this year, not only hadn’t ever made the playoffs, but they hadn’t even ever had a winning record…ever! Now, they are all in the postseason here in 2012, and one of them is going to win a game, considering the Texans host Cincinnati on Saturday. Dan Marino’s passing record (set in 1984) has been one of the most targeted records in the NFL, yet has stood tall for nearly three decades. Until now, when Drew Brees AND Tom Brady both broke this prestigious record. And, yet, another quarterback (Aaron Rodgers) is the odds-on favorite to take home the Most Valuable Player Award. Crazy. Maurice Jones-Drew ran away with the rushing title this year, despite playing in on a really bad team with the league’s worst passing attack. That means that teams routinely put 8, or even 9 guys in the box on every play against the Jags because MJD was the only guy who could do anything in that offense. When a team in the NFL is leading a game, they usually run the ball to work the clock and hold the lead. And, when they do throw, they are usually quick, conservative passes designed mostly to avoid negative yardage and turnovers. So, the fact that Jared Allen, whose team only won 3 games all year, would lead the league in sacks (and basically tie the “legit” all-time record) is absolutely incredible. Rob Gronkowski broke out this year with 17 touchdowns to lead the league from a position that, not too long ago, was basically a 6th offensive lineman. Now, in an era of big-play wide receivers and strong-armed quarterbacks, the Pats tight end had nearly 100 receptions to go with his 17 TDs. But, it doesn’t stop there, as Jimmy Graham (99 catches), the Saints tight end, was tied for 4th in the league with 11 touchdowns. Along with Gronk and Graham, Brandon Pettigrew (Lions TE), Darren Sproles (Saints RB), and Tony Gonzalez (Falcons TE) were account for five of the 12 players this year that caught at least 80 balls. Okay, maybe I’m just being a homer on this one, let us really think about this. The Chargers have been one of the best teams in the league and have, objectively, one of the most talented rosters, top to bottom, in the league, yet somehow they couldn’t win a division that was won by the 8-8 Broncos. The Eagles, who were 10-6 and division champs last year, added SIX Pro Bowlers in the offseason. Plus, the division was really, really bad – as shown by the mediocre (and that is kind) Giants winning the division at 9-7. Oh, and neither team can blame injuries, as they were relatively healthy. 15) Herb Pope, SR, Seton Hall: The senior out of Western PA has played his way onto this list over the first six weeks of the season. Not only is his team off to a surprising 11-1 start, but Pope has been dominant, averaging 20 points and 11 rebounds. The Hall hasn’t really played anybody, but Pope’s season highlights include 32 points vs. Northwestern and a 24 point/17 rebound line vs. Mercer. 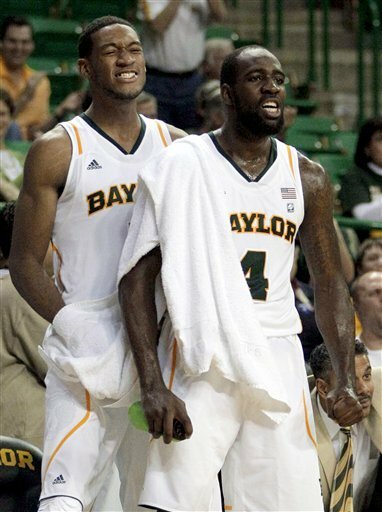 14) Quincy Acy, SR, Baylor: Acy has had a quietly excellent career as a rock solid, prototypical college power forward. He’s already played on some good teams, but this year’s edition may be the best they’ve had yet, and he’ll be a big part of that. He’s averaging 13 points, 7 boards, and 2.5 blocks while shooting over 60% from the field. At just 6’7″, he probably doesn’t have much future in the League, but he’s leaving a mark in Waco. 13) Mike Moser, SO, UNLV: This transfer from UCLA announced his presence on the national stage by putting up 16 points, 18 boards, and 6 assists in UNLV’s upset of then-#1 North Carolina. He also had 17 points/11 boards in a win over a ranked Illinois team and he is among the nation’s leaders in rebounding, with over 11 per game. 12) Mike Scott, SR, Virginia: UVA coach Tony Bennett is working on making the Cavaliers relevant again for the first time in a long time and Scott is leading the way. He’s averaging 17 points/10 boards and has posted double-doubles against solid teams like Michigan, Oregon, and Drexel. Last week he put up 33 points/14 rebounds against Seattle, which I didn’t know was a D-1 team, but still an impressive stat line. 11) Mason Plumlee, JR, Duke: The middle of the three Plumlee bros has steadily improved throughout his time at Duke and should probably be considered now among the nation’s best post players. He’s averaging 12.5 points/10 boards/2 blocks this year, and shooting 65% from the field. His season highlight to date was a 17 point/12 rebound effort vs. Kansas. 10) Perry Jones III, SO, Baylor: If this were an NBA prospect list he’d be definitely be close to the top, but Jones still doesn’t dominate on a consistent basis. Maybe part of the reason, though, is because he plays alongside another talented big man in Acy. After missing the start of the season with an injury, Jones is averaging 14 points/7 boards and had his signature game of the year so far in a win at BYU, with 28 points, 8 boards, 4 assists, and 3 steals. 9) Arnett Moultrie, JR, Mississippi St.: Moultrie was a two-year starter at UTEP before transferring, and he’s made an immediate impact for 14th-ranked MSU. He’s averaging 17 points and is among the nation’s leaders with 11.5 rebounds per game. Not all that surprising when you consider that he averaged over 8 rebounds a game as a freshman at UTEP three years ago. At nearly 7 feet, it would be nice if he could become more of a factor as a shot-blocker. He has just six blocked shots on the season so far. 8. Kevin Jones, SR, West Virginia: Jones has been a nice enough player in his career at West Virginia, averaging 13 points and 7 rebounds over the last two years, but he’s taken a giant leap this season. He’s averaging 20 points and 11.5 rebounds, which includes games of 30 points/12 boards vs. Kansas St. and 28 points/17 boards vs. Baylor. Those performances are even more impressive when you consider that KSU and Baylor are two fantastic defensive teams. Interestingly, Jones’ 3-point percentage has dropped from 40% as a soph., to 30% as a junior, to 20% this year. It may be time to stop shooting them (even if that hurts his NBA stock), because he’s shooting 67% on 2-point attempts, while taking a lot of shots. 7) Draymond Green, SR, Michigan St.: The Dancing Bear has been one of my favorite players in the college game for a few years now. He looks like a prototypical, banging power forward, but he can do everything. He’s averaging 15 points and 10 boards, but also about 4 assists a game over the last two years. He also picks up blocks and steals at a pretty high rate, and he can step out and knock down 3’s. He dropped 34 points on Gonzaga, grabbed 18 rebounds vs. UNC, had 4 steals vs. Duke, blocked 6 shots vs. Lehigh, and has dished out 6 assists in a game on three separate occasions. 6) Tyler Zeller, SR, North Carolina: It hasn’t been the start I would’ve expected for his senior season, but I still think Zeller is the best pure center in college basketball, so I’m leaving him pretty high on this list. A legit 7-footer with solid athleticism and a soft touch around the basket, Zeller is averaging 14 points/8 boards. He’s had a couple big games vs. weak opponents this year, but has also come up pretty small in a few contests. With all the talent he plays with, the numbers won’t be too big, but he should be better and more consistent going forward than he has been. 5) Terrence Jones, SO, Kentucky: Even more so than Zeller, it has not been the start to the season that Jones would’ve wanted. After inexplicably disappearing (4 points, 1 rebound, 6 turnovers) in the team’s loss to Indiana, Jones dislocated his finger in the team’s next game and missed a couple games. To his credit, he said all the right things after being benched for the final few minutes of that Indiana game. When he’s right, which should be soon, Jones is one of the premier talents in the college game (as he showed by averaging 16 points/9 boards as a freshman last year). His best game this year was a 26 point/9 rebound/4 blocks line vs. St. John’s. At 6’9″, 250, he can move better than most small forwards, and he’s hit 8 of 17 3-point attempts on the season. 4) Anthony Davis, FR, Kentucky: 6’10”, a bouncy athlete, highly-skilled, with a natural gift for blocking shots: it’s not hard to see why Davis projects as the #1 pick in next year’s NBA Draft. He had 14 points and 7 blocks vs. Kansas (in his 2nd collegiate game) and nearly had a triple-double vs. St. John’s with 15 points, 15 rebounds, and 8 blocks. He’s not yet dominant offensively, but 12 points a game, at over 60% shooting from the field, isn’t too bad. He’s pulling down 10 boards a game and leads the nation in blocks, at 4.5 a game. 3) John Henson, JR, North Carolina: Henson is a guy that has definitely played his way up on this list in the first two months of the season. After a freshman season where either he or the team thought he was a small forward, the freakishly-athletic and long 6’11” forward has learned that his role is to stay around the basket, and he’s become one of the best big men in the country. He started off the season by blocking 9 shots vs. Michigan St. in that aircraft carrier game. He also had 17 rebounds and 5 blocks vs. Wisconsin and 24 points/10 boards/4 blocks vs. Long Beach St. Like he did last year, he’s averaging 10 rebounds and over 3 blocks a game, but he continues to progress offensively, averaging 14.5 points on 55% shooting. 2) Thomas Robinson, JR, Kansas: I know Kansas has been loaded over the last couple years, but I still never understood why they couldn’t find more minutes for Robinson. Most times he came into the game he looked like the best player on the floor, as a powerfully-built, super-athletic 6’9″ post man. There was some talk that his max-effort style couldn’t be sustained as a starter. Well, he seems to be sustaining his production just fine, averaging 17.5 points and ranking 3rd in the nation in rebounds, at just under 12 a game. Season highlights include 20 points/12 boards vs. Georgetown, 16/15 vs. Duke, 26/11 vs. Long Beach St., 21/7 vs. Ohio St., and 21/18 vs. Davidson. 1) Jared Sullinger, SO, Ohio St.: I did this list last year as well and Sullinger was an easy #1 then, so you know he was an easy call at #1 again. He’s had to deal with a couple different injuries already this year, which is part of the reason that his numbers (16 points/10 rebounds) don’t blow you away. Still, like last year, OSU is one of the the 3 or 4 most talented teams, so his numbers won’t do justice to how good he is. He’s the most hard-to-stop low post scorer in the college game and owns the glass. He showed recently that he might be back on track after the injuries, with 17 points/14 boards vs. Northwestern.